The IOGEAR PS/2 KVM Console Extender GCE250 allows access to a computer system or a KVM switch from a remote console (keyboard, monitor, and mouse), from up to 500 feet away, via a CAT5e cable. The IOGEAR GCE250 unit is perfect for moving the console away from the computer or the KVM switch. Your console can be moved across the room or hall, out of the server room, or anywhere that is most convenient. IOGEAR GCE250 is also useful for security and monitoring purposes, where you can have the system unit in a secure area at the same time that you put the console in the most convenient location for user access and monitoring. 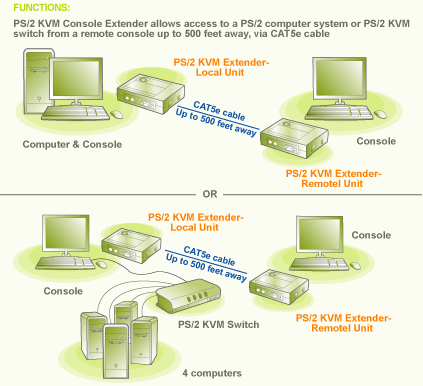 A PS/2 KVM Console Extender is a cost effective solution because it uses inexpensive UTP (CAT5e) cabling to extend the distance, versus expensive and bulky coaxial cabling. IOGEAR GCE250 is easy to install and operate because of the Auto Signal Compensation (ASC) technology, which senses the distance and adjusts the signal levels accordingly so there is no need to do any dip switch setting. VGA, SVGA or Multisync card. 6-pin PS/2 (mini-DIN) mouse port. 6-pin PS/2 (mini-DIN) keyboard port. * Adapters not included, but can be purchased separately.